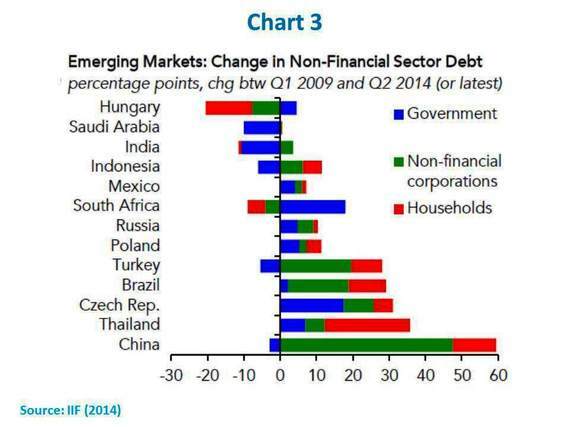 Since last year there has been much talk of possible financial stress stemming from increased debt leverage in non-financial corporates of emerging markets economies. A recent study has brought to light some key evidence on the Latin American case (Bastos et al, 2015). Back in 2013, I called attention to new features of international long-term private debt finance in developing countries that arose since the global financial crisis. While global cross-border bank lending with maturities at or beyond five years slowed down after 2008, bond issues have more than filled the void, explaining a rise in total flows since then. While banks in advanced economies - especially in Europe - were deleveraging, unconventional monetary policies and hype about emerging and frontier markets comprised a favorable backdrop for a massive surge in the latter's bond issuance (Chart 1). 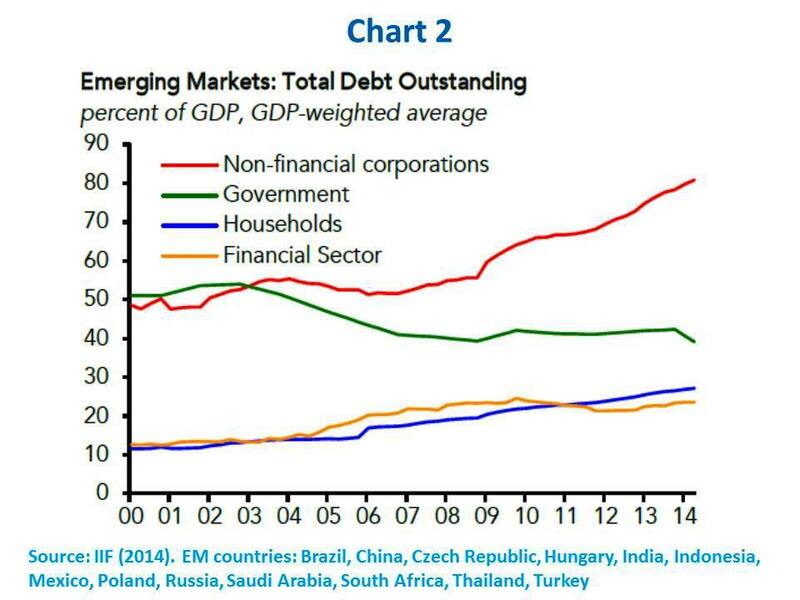 "(...) the outstanding volume of EM non-financial corporate bonds has reached a record of more than US$2.5 trillion. Altogether, the increase in borrowing--by 20 percentage points--has boosted the debt-to-GDP ratio of the non-financial corporates to about 80% in emerging markets." As depicted in Chart 3, China stands out, not only in magnitude - the non-financial corporate sector debt moved up 48 percentage points to close of 150% of GDP between the first quarter of 2009 and June 2014 - but also because of the dominance of domestic circuits, with a rising role played by the shadow banking system. Other EM economics (including Turkey, Brazil, Czech Republic, India and Russia among those covered in the IIF's sample of countries) also saw their non-financial corporate indebtedness increase to levels close to 50% of GDP, with bond issuances in both foreign and local currencies (Chart 4). According to the IIF, international bond markets were at around 30% of the US$1.6 trillion issued by EM non-bank corporates since 2009. No wonder then that concerns about EM non-financial corporate debt surfaced last year (for example see Chui et al (2004a) in the September issue of the BIS Quarterly Review). Given the forthcoming normalization of the US monetary policy and current dollar-appreciation trends, would EM corporate balance sheets be highly vulnerable to rolling and foreign currency risks? Furthermore, wouldn't they also be fragile given lower growth prospects for EMs as well as falling commodity prices? Might such potential fragility generate spillovers onto local banks and the international financial system, sparking damaging feedback loops more broadly? After the global financial crisis, shortcomings in existing systems of monitoring of macro-financial linkages have been acknowledged - see Canuto and Cavallari (2013). As an attempt to spot "dark corners", where "danger lurks", prior to getting too close to them - to use Olivier Blanchard (2014)'s terminology -- paying attention to extraordinary surges in specific financial markets about to undergo potential shocks has become the new practice. Latin American Non-Financial Corporate Finance: how deep are the "pockets of risks"? In the case of Latin America, a major study by Bastos et al (2015) has just been released. Using micro-level data on bond issuances and corporate balance sheets for close to 1,000 listed non-financial companies between 2003 and 2013 in 5 major economies (Brazil, Chile, Colombia, Mexico, and Peru), the authors gauge whether non-financial corporate balance sheets have become more vulnerable to shocks and how their risk configuration has evolved. First, like their counterparts in other EMs, non-financial corporates in those 5 countries have recently increased their balance sheet leverage ratios, a result consistently found across different measures. However, that leverage is still lower than ten years ago. The surge in debt ratios since 2010 represents a rebound from previous reductions of leverage, being accompanied in some instances by a decline in non-debt liabilities. Second, and relatedly, the active bond issuances in the past few years (Chart 5) has meant a change in the composition of liabilities, with bond issuances replacing bank loans. 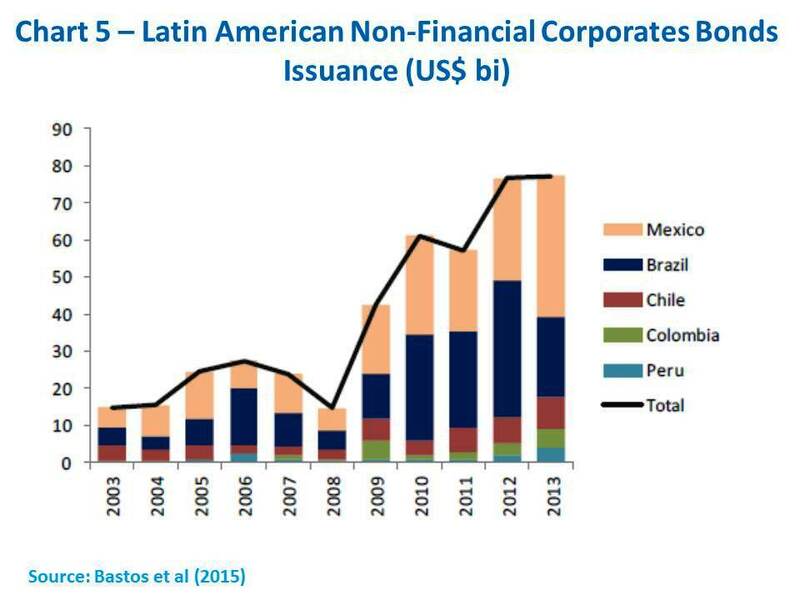 Latin American non-financial corporates' debt finance mirrored the broader compositional shift in long-term private debt financing to EMs previously mentioned. Third, such shifting debt liabilities have been accompanied by a switch in types of risk exposure. On the one hand, the average maturity of their debt has lengthened and amortization profiles are now smoother, with lower interest rates being locked-up across the yield curve, as well as floating-rate debt shares maintained at low levels. On the other, the share of foreign-currency debt has expanded, which in turn means greater exposure to foreign currency shocks. Naturally hedged debtors (commodity and manufacturing exporters) were responsible for a substantial chunk of bond issues, but domestically-oriented sectors were also issuers. At the same time, the extent of financial hedging against foreign-currency risks is not easy to gauge. "The extent of un-hedged exchange rate exposure in the corporate sector cannot be ascertained with a significant degree of confidence, given that systematic and comprehensive information on relevant offsetting variables (notably natural hedges from net export proceeds, foreign currency income from multinational operations and FX derivative positions) is not simple to construct." Fourth, the authors find that, although debt servicing capacity has stayed generally stable, there are areas of weakness. Those "pockets of risk" are to be found especially in parts of Mexico's corporate sector and in Brazil. 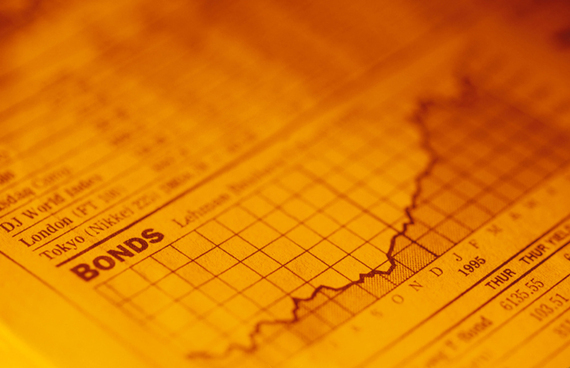 Slower earnings growth have until recently been outweighed by lower borrowing costs. However, not only the financial-cost landscape is likely to be altered as US monetary policy becomes normal in the near future, but non-brilliant prospects also lie ahead for commodity prices and economic growth in the region - see World Bank (2015) and Werner (2015). Overall, it does not look like major financial excesses in terms of non-financial corporate debt leverage or deteriorating debt-servicing capacity have taken place. 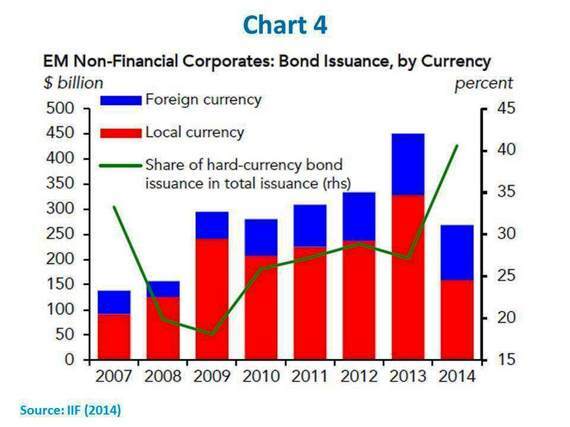 Indeed, the surge in bond issuance has served to a large extent to manage corporate liabilities. Nonetheless, even if a major financial danger does not seem to be lurking around a dark corner, given current levels of leverage and expected moves by US monetary policymakers, as well as commodity price softness, the region should not count on some sort of corporate leverage-based way out of its currently subpar economic prospects. Furthermore, there remains a blind spot in the case of non-naturally-hedged corporate foreign-exchange risk exposure. First, the post-crisis high-profile role played domestically by low-cost public banks' provision of finance, helping some corporates to keep low borrowing costs. That now is bound to retrench as part of the ongoing fiscal consolidation program. Second, the weight of debt built up through foreign subsidiaries and other off-shore vehicles, either to support operations abroad and/or to escape from capital controls and taxes. 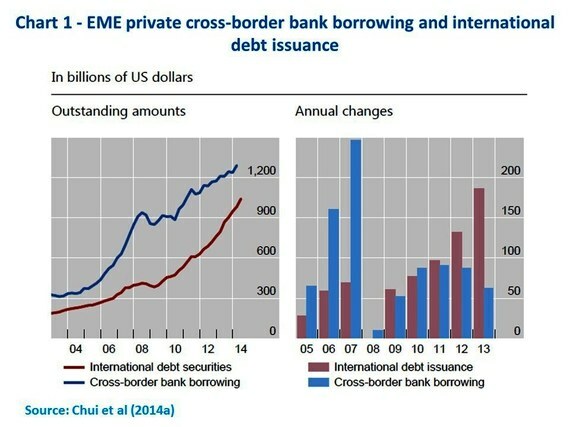 In this regard, Chui et al (2004a) singled out Brazil and China as major EMs where local corporates resorted to issuance of international debt via overseas subsidiaries, including non-banking vehicles - in Brazil's case, a regionally peculiar feature also highlighted by Bastos et al (2015). As approached by Chui et al (2014b), this raises difficulties with respect to measuring foreign debt inflows from a country's balance-of-payments standpoint. Flows recorded as foreign direct investment in Brazil correspond partially to foreign debt issuance by subsidiaries or other offshore vehicles. It also makes it harder to discern whether bond issuance is driven by real activities rather than financial operations. Thirdly, the massive program of foreign-exchange swaps offered by Brazil's central bank since the "taper tantrum" of 2013 - with its notional value having recently reached around US$ 110 bi, or a bit less than 1/3 of the value of foreign reserves. Swaps are denominated in local currency, but they have become the flipside of low-cost foreign-exchange hedging for both financial and non-financial corporates. Unwinding such programs and allowing for local-currency depreciation will be a welcome move but action should be caution and gradual. Finally, the outcome of Petrobrás on-going corporate-governance crisis will likely contain a downward adjustment on the asset side of its balance sheet. Additionally, while the process unfolds, its suppliers in the private non-financial corporate sector will remain subject to financial rollover risks, at least until the crisis abates. All opinions expressed here are the author's own and do not necessarily reflect those of the World Bank.